Home › emissionsgate › How long until the VW VAG Emissions fix claims it’s first victim? As the media attention hots up around the so called VW VAG emissions “fix”, one aspect that has been greatly overlooked is the danger that failing vehicles pose on our roads. 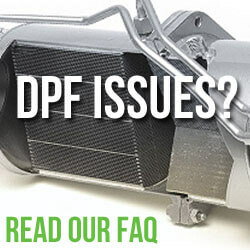 We’ve been contacted by a number of owners who have had EGR / DPF failures resulting in the vehicles entering “limp mode” during normal driving conditions. This “limp” mode is caused by an error generated by an engine component / sensor which in turn greatly reduces vehicle performance. This is achieved in modern diesel vehicles by reducing fueling and turbo operation. When travelling at speed, sudden loss of power is not only frightening but it also poses a huge danger to other road users and pedestrians. The loss of power could result in a legitimate maneuver being a downright dangerous one. 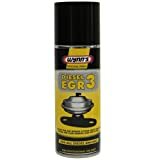 Just how common is EGR failure after the fix? 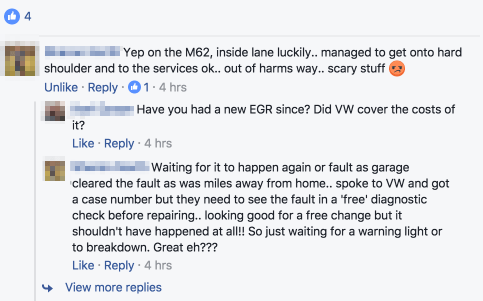 EGR failure accounted for 66.9% of the issues reported “post fix” in our VW emissions survey, and has proven to be the single biggest complaint following the fix as seen in our comments. 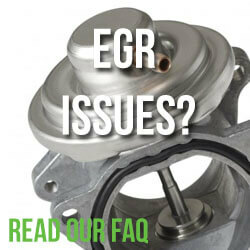 You can read more about EGR failures in the links are the bottom of this article. Lets hear owners experiences of “limp mode”, you’ll soon understand what a frightening ordeal it can be. With potentially thousands of vehicles ready to fail at a moment’s notice, it’s only a matter of time until the emissions fix claims it’s first innocent victim/s. With blood on VW’s hands will our inept government take action and should it really take such a horrific and avoidable accident to prompt action? I for one wouldn’t even consider putting myself in that position to the extent that I point blank to drive or be driven in a car that has been “fixed” by VW. In fact I go as far as to give 2006 – 2015 VAG vehicles a bit more distance in front if I’m following them. The most important thing to do if your car enters “limp mode” during driving is not to panic. Do not make any sudden changing in direction and certainly don’t jump on the brakes. Put your hazard lights on and try to coast / limp your vehicles to a safe position. If can’t find a hard shoulder or place of refuge take all safety precautions possible and leave the vehicle by the side of the road. Be sure to open your bonnet or boot to indicate that you are in need of assistance. If your car poses a danger to other road users then call the emergency services. 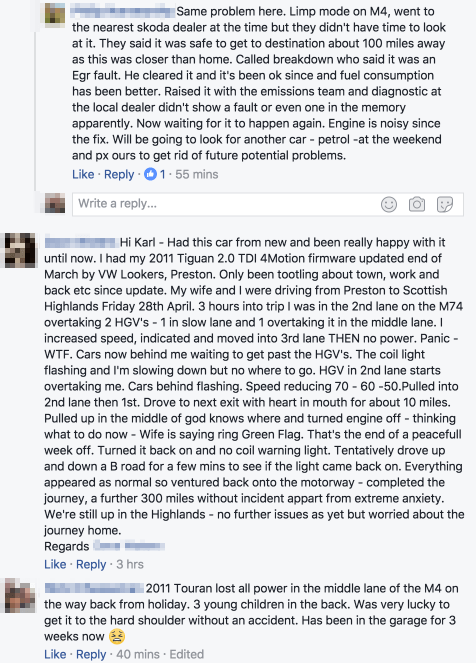 If you’re one of the many owners affected by the emissions fix then please do join the The Volkswagen Diesel Customer Forum (Emissions Scandal) Facebook group. https://www.facebook.com/groups/955027937948541 – The group members and the hard working admin team work tirelessly to raise the profile of group to secure justice for those affected. ‹ VW Emissions Fix Survey – The Results are in! This happened to me on the M1 on Sunday; scary but fortunately I was just approaching an exit and was able to safely come off the motorway. It’s going back to the garage tomorrow – this is now the 4th time my car will have been back in following the “fix” in December. The car had been a dream & troublefree for 6.5 years until this. Absolutely scandalous. I’m an Audi A3 1.6 Diesel owner and the engine was one of those affected. 1 week after the update I was traveling along a busy 2 lane motorway in the outside lane going up a hill when the engine lost power. It would not accelerate no matter how hard I pressed the accelerator. I managed to limp across to the hard shoulder while other cars sped past. It had entered some type of limp mode and would not do more than 2k rev’s. The glow plug light on the dash was flashing and the engine was running but really rough. I had to call the AA and was towed home. They said there was an issue with the Injectors in cylinder 3. I took it to a local garage as the nearest Audi dealer is miles away. They replaced the common injector rail but I believe it still runs a little rough compared to before the “fix” by Audi. I did ring the Audi Dealer but they were not much help and wouldn’t accept that the “fix” caused the problem. My car has never recovered from the fix; reduced MPG, performance issues and noisy engine. I have recently done my recall for my vw sharan 2013 plate after two weeks the EGR valve gone then I had to change one of the independent garage after that my add blue is finishing every 2500 drive I don’t know what to do I have spent about £1800 could you please tell me how can I solve the problem and how can I claim for my expense.